We joined forces with NYS Path Through History Weekend and Albany County Historical Collaborative to celebrate the story of our town. Visitors picked up maps and guides at the Saddlemire Homestead, then toured our beautiful countryside to learn about the history of Knox. More about our trails here. On Saturday, we dedicated and unveiled a new historic roadside marker on Knox-Gallupville Road (County Route 255). 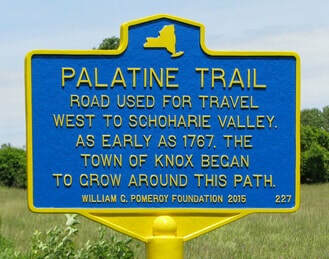 Following an introduction by President Dennis Barber, Trustee Dan Driscoll told us the story of the old Palatine Trail, roughly where Route 156 and Knox-Gallupville Road now lie. The group then drove to the site, and Dennis revealed the new marker, which was funded for the Town of Knox by the William G. Pomeroy Foundation. More info on the Palatine Trail here. 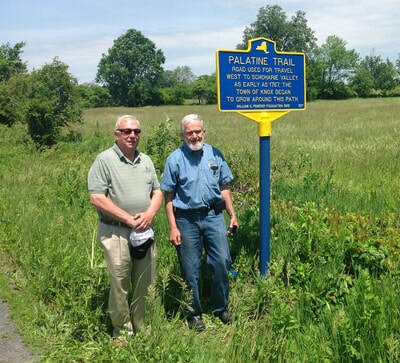 Town Supervisor Mike Hammond and Trustee Dan Driscoll, both outstanding in their field, admire the new historic marker on the Knox Gallupville Road. Check out the database of NYS historical markers. On June 22, John Elberfeld and Jane McLean took the story of Knox's Lt. Michael Barckley to the fifth grade classes at Berne-Knox-Westerlo school. The students used original sources, including a letter written by Barckley and a drawing of the Battle of Cold Harbor, to learn about local involvement in the Civil War. Suitcases of History is a collaborative effort with BKW, Helderberg Hilltowns Association, and KHS. Join us for a fascinating look into the past. Our speaker from Albany's Schuyler Mansion will acquaint us with the ways our ancestors coped with primitive water supplies and inadequate waste disposal. The topic may not seem pretty or appealing, but here in the Hilltowns, many residents faced the same challenges well into the modern era. The Saddlemire Homestead will be open 2:00-4:00 that afternoon. Visit our new display on personal health and hygiene. We're showcasing several items from our collection, as well as engravings and quotations from the book The Guide-Board to Health, Peace and Competence by Dr. W. W. Hall. Learn more about Dr. Hall here. ​ about personal health and hygiene. The Wolford family adult commode is an 1850s Hitchcock-type chair with stenciling and removable chamber pot. Member Zenie Gladieux of Berne donated the chair. Pauline Williman, member of Kiwanis Club of the Helderbergs, has fond memories of her days at the one-room schoolhouse. Photo from Kiwanis Magazine. "The Little Schoolhouse That Could"
School #5 on Ketcham Road was featured in September's Kiwanis Magazine. Click on the link to the right to read the article. More about School #5 here. Order "History of a One-Room Schoolhouse in Knox, NY" by Daniel A. Driscoll here. Four generations of the Stevens family dropped by Knox Town Hall to see the display of photos and stories. Skyler recently visited the Saddlemire Homestead with her grandfather and found a photo of him in the Pill Box Room. More on the Stevens family here and here. The Knox Historical Society recently unveiled a new exhibit at the Knox Town Hall on the Stevens family and the Mobil Gas Station. The Stevenses are long-time residents of the town, and the Stevens name is synonymous with Knox. The gas station in the hamlet was run by Margaret “Si” Stevens for 33 years, after she took it over when her father, Daniel Webster “Web” Stevens died in 1970. Through photographs, the exhibit shows the changes to the property from when it was first purchased by Mr. Stevens from the Baxters in 1929. Originally a blacksmith and wagon shop, the property eventually became an anchor in the town, serving the needs of the local residents for many years. The Knox Historical Society will continue to unveil themed exhibits throughout the year, rotating every few months. The museum at the Saddlemire Homestead is open on Wednesdays from noon to 2 p.m. through August. 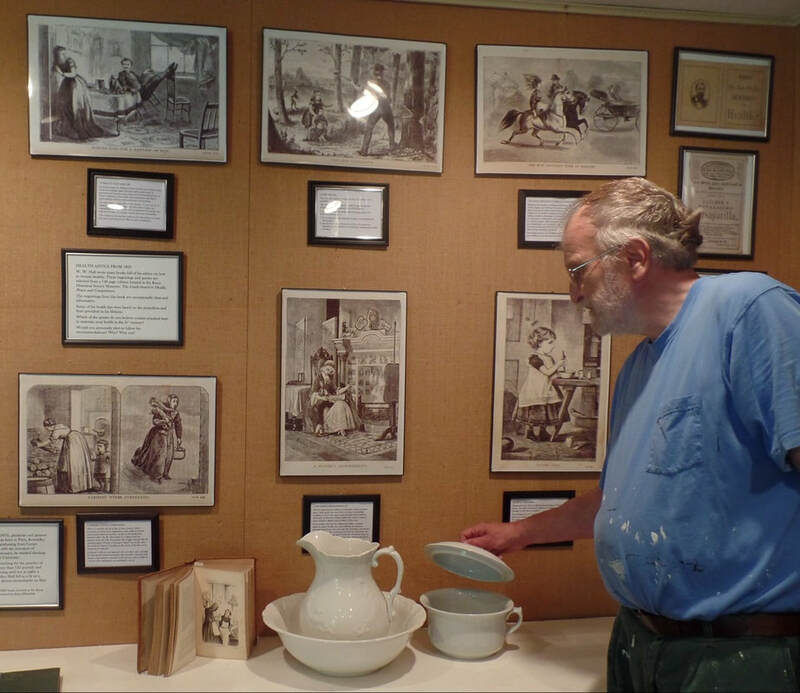 The display at the Town Hall makes it possible to share the town’s past with visitors and residents alike — but it is not limited to history. If you have any pictures or photographs that you would like to display, please contact me at jenngeckler@gmail.com or 203-444-2014. The Kitchen Gets a Makeover! Our kitchen got a well-deserved makeover in July. John Elberfeld painted, moved furniture, and put up shelves. Jane McLean created new displays and signage to showcase the collection. The very old handmade mechanical apple parer led to an exhibit of apple parers and pie-making equipment. President Dennis Barber demonstrates the two-fork method of cutting shortening into flour to make a pie crust. More at our Virtual Tour. Thanks to the William G. Pomeroy Foundation for providing funding to the Town of Knox for our latest marker. Trustee Dan Driscoll told us about the 14 historic roadside markers in Knox, while Nancy Frueh and Jane McLean showed related items from our collection. Following the presentation, we unveiled the new marker on Township Road. Dan has updated the historic marker booklet to include our two newest ones, The Palatine Trail and Toll Gate #3. ​The Saddlemire Museum was open for self-guided tours and refreshments on the porch. Trustee Dan Driscoll plays "The Duke of York's March" on the pennywhistle during his multimedia presentation about the historic markers of Knox. Dan also used PowerPoint and maps to tell the story. Vice president Jane McLean explains that Tenney and Howell's 1886 history gives one version of the naming of Knox. 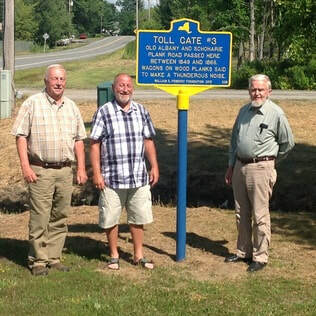 Knox Town Supervisor Mike Hammond, Dennis Barber, and Dan Driscoll at the newly installed historic marker, provided by the William G. Pomeroy Foundation. ​The marker is on Rt. 146 near the Albany County highway garage. The old Albany-Schoharie Plank Road was built of planks set across stringers, causing “a rumble as of distant thunder resounded across the countryside, as the wagons, coaches, and herds of stock traveled up and down,” according to a 1932 essay on the subject. KNOX — The town of Knox and the Knox Historical Society will dedicate the new Plank Road Toll Gate 3 historic marker on Sunday, Aug. 9. The event will begin at 2 p.m. in the Knox Town Hall on Route 156 with a brief review of all 14 historic markers in the town, and related historic documentation. Weather permitting, we will then carpool to Route 146 east of Witter Road for the unveiling of the new Toll Gate 3 historic marker. An article in the Aug. 12, 1932 Altamont Enterprise describes Miss Mary D. Gregg’s Altamont High School graduation essay, “The Old Schoharie and Albany Plank Road.” Her essay deals in detail with the story of the Albany-Schoharie Plank Road from its incorporation in 1849 by the Plank Road Association to its abandonment in 1866. Toll Gate 3 was at “the eastern end of the settlement of East Township.” The article even has a picture of Foster Williamson, a tollgate keeper of Gate 3. According to Miss Gregg, the structure of a plank road was not complex. As a base, six parallel stringers, 3- by 4-inch timbers, usually of hemlock or birch, were laid in the ground end to end. Then 9- or 10-foot long planks were laid crosswise as close as possible, but never nailed. The fourteen NYS Historic Markers in Knox, information about their installation, and related artifacts from our collection in the Saddlemire Museum. At our September meeting, metal detectionist Andrew Albert shared his collection of local finds with us. He punctuated his talk with the sounds his device makes as it passes over different metals. Members of the audience helped Andrew identify some of his artifacts, including a capacitor and a turnbuckle. Andrew is donating a display of items to the Saddlemire Museum. Thank you for sharing your collection with us! "In this space, we wrote of the importance of preserving and learning from local history. Now the Knox society is flourishing and its members are enriching the community by supporting events as varied as a path through the park with pages of a history book; a new marker commemorating the toll road; displays and exhibits on a variety of worthwhile topics; and, because of member John Elberfeld’s project, an ever-growing trail of barn quilts stretching across the Helderbergs." We recently collaborated with Friends of the Berne Library to install the second StoryWalk at the town park behind the fire station. Here the Reffe children learn about Henry Knox in "Henry and the Cannons: An Extraordinary True Story of the American Revolution" by Don Brown. Was the Town of Knox named for this hero?